Want to Restore An Older Home? A labor of love! Chris and Tiffany of Northampton, PA were the perfect couple to restore an older home nestled next to the tranquil creek and 170-year-old Kreidersville Covered Bridge in Northampton PA. The charming home deserved special attention, and Chris and Tiffany provided just the TLC it deserved. Chris is a talented and detail-oriented woodworker and Tiffany is a creative DIY-er with vision! The newlyweds spent a couple of years restoring the home to perfection. Just two months after they moved in, Chris & Tiffany got married in their beautiful backyard and hosted their reception at the covered bridge. Perhaps the largest project was the kitchen. Chris crafted all of the cabinetry and wood work over eight long months. 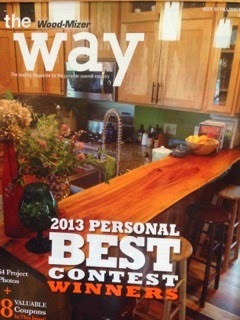 The finished kitchen is incredible — and they won a well-deserved award, prize and front cover on the Wood-Mizer magazine! A front porch with a view! 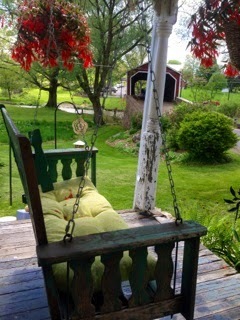 The swing overlooks the 170-year-old Kreidersville Covered Bridge and creek.